One of the best things about ballroom dancing is the variety of styles you can do! Ballroom dances are split into four categories—two international styles and two American styles. Each style has four or five dances. Some styles have dances with the same name, but the dances themselves can be drastically different! There are plenty of dances that aren't strictly ballroom dances, such as hustle and West Coast swing. People often dance these at social events like weddings or clubs. There are also some popular traditional and folk dances like the Polka. Click on any of the dances below to read about them and watch a video to see what the dance looks like! International ballroom is a style of dance characterized by long, swinging motion that follows a "line of dance" counterclockwise around the room. Ballroom dances are always with a partner and in the international style partners maintain a closed hold—there are no separations or spins. Figures emphasize motion in the line formed by the couple's arms, torso, and legs. Typical attire for performance/competition is a full tailsuit for the lead and a gown for the follow. Originating as a folk dance from Austria, waltz is a dance in 3/4 time characterized by smooth, gliding motion. The music is typically slow with a heavily accented first beat. Many waltz performances and songs are emotional and evocative of love or sadness. Tango originates from Latin countries and has a "march" quality. Usually in 2/4 or 4/4 time, tango often looks violent or angry. This quality comes from its sharp, quick qualities which are achieved by small controlled motions. Don't give your partner whiplash! Foxtrot is often danced to big band music. This dance allows for a lot of musicality, playing with the "slows" and the "quicks" on its many figures. This dance can be intimidating for beginners as the "basic" step is a sequence of six figures! Dancing to Sinatra once you've got it all down is well worth the effort, though. This aptly-named dance is energetic and will get you moving around the floor. This dance appears playful and light on the feet though it requires a great amount of physical exertion! Quickstep was developed out of the foxtrot and Charleston by Caribbean and African dancers in New York City in the twenties. In contrast to the slow waltz, Viennese waltz is danced in 6/8 time and is much faster. The international style consists of just seven figures, with most dancers sticking to only three. The Viennese Waltz involves a lot of spinning, so take your dizzy pills beforehand! This is almost always the dance you'll see in a ballroom in the movies. 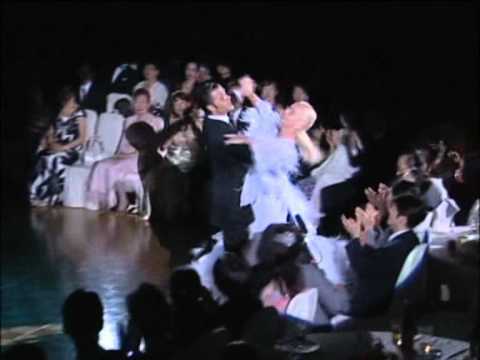 American style ballroom (smooth) shares many aspects with the international style, but allows dancers to separate into more interesting figures. The swinging motions remain, but dancers can also cross their feet and dance "jazzier" moves in place and side-by-side! American slow waltz maintains many of the characteristics of the international style, with the added concepts of separated figures and crossing of the feet. This makes things more interesting (and also more complicated)! American tango allows the couple to separate for some figures and many of the beginning figures follow a "slow, slow, quick quick slow" pattern (easy to remember by spelling "T...A...N-G-O..."). The American foxtrot basic step is much easier than the international variety for beginners. The lead steps forward twice, then to the side, and repeats going backward. There are a number of easy steps to learn beyond the basic as well! The American rendition of Viennese Waltz allows for a lot more variety than the international version. Dancers may separate and several figures are danced in place without continuing to spin. Recommended for those with severe motion sickness! Latin dances are often fast, energetic, and showy. Performers often wear sequined, flashy clothing. Latin dances are heavily inspired by traditional music and dances from South America and the Caribbean. The music can be very complex which is fun when you've developed an ear for it! Latin dances involve a motion in the hips that's hard to learn but fun to use. The modern cha cha is the direct result of a music style developed in the 1950s, but has deep Afro-Cuban roots. It's also influenced by mambo and this is evident in some of the figures. Cha cha dancing is sharp and fast. Rumba is a romantic dance that plays with closing in and pushing away between the dancers. Performances often tell a story and you never know if they'll end in happiness or total anguish! The dance is more smooth than cha cha but still has many sharp movements to cut through the more fluid motion. Samba is another dance heavily influenced by West African music and culture. The musical style came out of urban Rio de Janeiro and is still the focus of Carnival every year. The dance that's learned and competed in international Latin style is a more formalized, limited dance. If you like progressive dances then samba is the Latin dance for you! It's the only Latin dance that moves around the floor. Developed from the jitterbug, jive is one of the most strenuous dances out there. The music is rapid and dancers constantly lift their legs up high and work their core. This dance has plenty of spins and turns as well, so you're in for a ride! Paso doble is a comparatively rare dance learned mostly by competitive Latin dancers. The dance is nearly always danced to a rendition of the song España Cañi and mimics a matador (the lead) flourishing a cape (the follow). There are several points in the music that reach a dramatic climax, at which point dancers choreograph a figure to match. These "highlights" are the subject of much applause! American rhythm dance is the answer to the international style. At first glance many of the dances are identical to their Latin counterparts. However, the technique differs greatly and the available figures vary. American cha cha differs from the international style mainly in the syllabus and the way the music is expressed in the dance. While international cha cha depends on dynamic changes in figures, American focuses more on the continuous motion of the body. American rumba differs greatly from international. The basic step is in "slow, quick quick" time and forms a box. Many similar figures are danced from this basic, but many maintain the "slow, quick quick" timing which is not prominent in the international style. Comparable to jive from international style, swing is an upbeat, energetic dance with a lot of fun figures. Fortunately, the music is much slower! This dance is often done to rock music so it's a chance to jam hard. Bolero is a 3/4 dance originating in Spain. Visually, it has elements of rumba and waltz. The latter is due to its sweeping motion and the rise and fall in the dance. Bolero is most often learned by competitive rhythm dancers but can be a great one for beginners if they find the right instructor. The first mambo was a dance invented in Cuba in the early part of the century. Modern mambo is very similar to salsa but danced on the two beat. The dance was standardized to market it to professional studios, since the original dance contained no specific basic steps. Despite this, the modern mambo is lively, fun to dance, and entertaining to watch! There are a host of dances that aren't formally part of many ballroom competitions or syllabi but that still deserve a place on this list! These dances are as fun and technical as any. If you want to step away from the familiar world of ballroom and Latin, one of these might be just for you! West Coast Swing has its roots in Lindy Hop as with many other swing dances. This dance has a much smoother look to it, however, as a result of the posture held while dancing. Each partner keeps a much lower center of gravity and pushes their feet into the floor, making them appear to float at times! Hustle is a fast dance straight from the disco era. You'll see a ton of spins, turns, and even some flips. 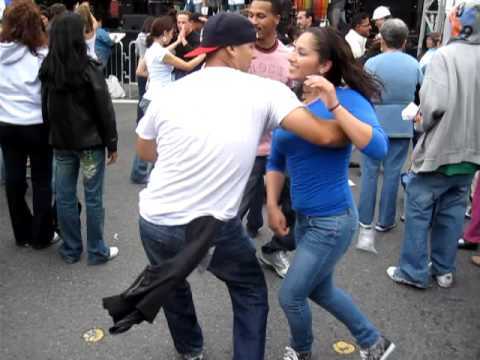 The dance is often done so that the partners are constantly turning or passing each other. This dance is easy to improvise and there's an endless list of figures! Chances are good that you can find a club near you where people will dance almost strictly salsa for a few hours straight. The dance's popularity is due to the ease of the basic step, the number of figures available, and the community built around it. People love salsa! Learn the basic and head out to the club. People are usually happy to show you a few new moves! Zouk is a dance growing like wildfire in popularity. Zouk evolved from dances like lambada, bolero, and samba and is characterized by controlled body movement. Lead and follow work closely together in the dance, producing motion communicated through the connection. Polka is a central European dance that progresses around the room. The basic step consists of short half steps that can be done in a shuffling manner or in a more energetic hop. Argentine tango is very different from its ballroom cousins in both the music and the technique. The Argentine version is heavily dependent on lead, follow, and improvisation of flourishes by the follow. The music often includes an accordion- or organ-like sound that creeps along similarly to the dance.